Quick tips: What is website hosting? Website hosting is a professional service that enables individuals and organizations to publish a website or blog onto the www. A web host, or web hosting service provider, is a business that supplies the services and technologies needed for the website or webpage to get seen on the Internet. 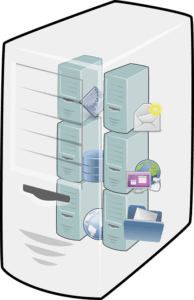 Websites are hosted (stored) on special computers called servers. When Web users choose to look at your online site, all they have to do is type your online site address or domain (for example: www.sillymoosedesigns.co.za ) into their internet browser. Your visitor’s computer looks at your hosting server and your webpages are delivered through the browser. A browser, like Google Chrome, converts the codes and images into the website users see. Most hosting companies require that you own your domain in order to host with them. When you decide to create or host your website with SillyMoose Hosting we’ll offer you a bundle. So, you can get your domain name, email addresses, and web storage all bundled into one subscription. Everything you need stays under one roof. We’ll also supply an actual human to assist you every step of the way. Let us know what you need. We have awesome standard hosting packages, but you can also customize a solution that best fits your pocket. Pop us a message and we’ll help you decide, ’cause we’ve got this! With the rise of internet shopping and e-businesses, it is no surprise that the popularity of hosting services is higher than ever before. The rate at which small businesses are registering for hosting services is breaking its own record every year. This might be a confusing thing to understand if you are new to online business, but fear not… we’ll walk you through it all. Okay, got it, what’s next? Features of a Hosting Plan. Understanding email: POP and IMAP? WordPress: 14 Reasons you absolutely need it! Email: POP vs. IMAP? – Life Rebel Apprentice on Quick tips: What is website hosting? Email: POP vs. IMAP? – GIG GPS on Quick tips: What is website hosting? Quick tips: What is website hosting? | SillyMoose Designs on Shared or Dedicated Hosting?